We’ve all been there. You’re in a job that’s OK, but it isn’t really what you want to do. You wake up every day with that numb feeling and even though you’re not happy, something holds you back. A niggling thought in the back of your mind that stops you from taking the plunge. Below are 3 of the most common things we hear that stops you from throwing caution to the wind and making a career change. Money – We often hear that you’re on a certain wage and you know that if you make a change you might have to take a pay cut. This is often the case but it doesn’t have to be the end of the world. Budgeting and working out your spending can sometimes help you to make some savings that could help you to cope with a pay cut. We also hear that you can’t afford to do the training. Remember, in some cases funding might be available. Talking to a careers adviser can be a great way to find out if there is any funding available. If there isn’t, think about how you can save up for the course. You may need to make sacrifices, but, if you really want to make that change, it’ll all be worth it in the end. Time – I have no time I hear you cry! Sometimes that’s completely true and you might have to view your change as a long term goal that you work towards bit by bit. However, what I find most often is that by making sacrifices you can find the time. Be honest and make a diary of your week. See how much time spending watching TV, reading, hanging out with friends etc. You may find you have more time than you thought, I know I did! Fear – Fear can be what keeps us safe. On the other hand, it can also stop us from doing the things we truly want to do. Sometimes it is fear of the unknown that stops us. Not knowing what a change would be like or whether it’s the right move. Often it’s a fear of failure; will I be able to do it, what if it doesn’t work out? These are all normal feelings but think of it this way, if you never try, you’ve already failed! 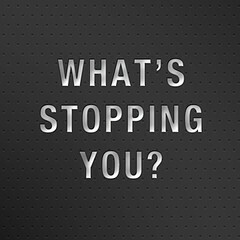 So what’s stopping you from making the change? Or, did you make a career change and wish you had done it sooner? Get involved and tell us your stories!